Judge Gray was awarded a B.A. from UCLA, a J.D. from USC, and honorary law degrees from Chapman University and Western State College of Law; was a Peace Corps Volunteer in Palmar Norte, Costa Rica; a criminal defense attorney with the U.S. Navy (awarded a combat action ribbon in Vietnam); a federal prosecutor in Los Angeles; a trial court judge of the Superior Court of Orange County, California from December 1983 until January 2009; and the 2012 Libertarian Party vice presidential nominee, along with former New Mexico Governor Gary Johnson for president. Gray is the author of multiple books, the composer of the high school musical revue "Americans All;" a public critic of current American drug laws; and for several years wrote a weekly column for the Daily Pilot newspaper entitled "It's A Gray Area." Gray has been a member of the California Judicial Council, as well as the California Judicial Council's Advisory Committee on Juvenile Law, the Alcohol Advisory Board to the Orange County Board of Supervisors, the Advisory Board of the California Department of Alcohol and Drug Programs, the Orange County Law Library, and the Board of Councilors of the USC Law School. Gray also introduced Orange County to the Peer Court system, where juvenile defendants travel to a school outside their district to have their actual cases tried by other teenagers. 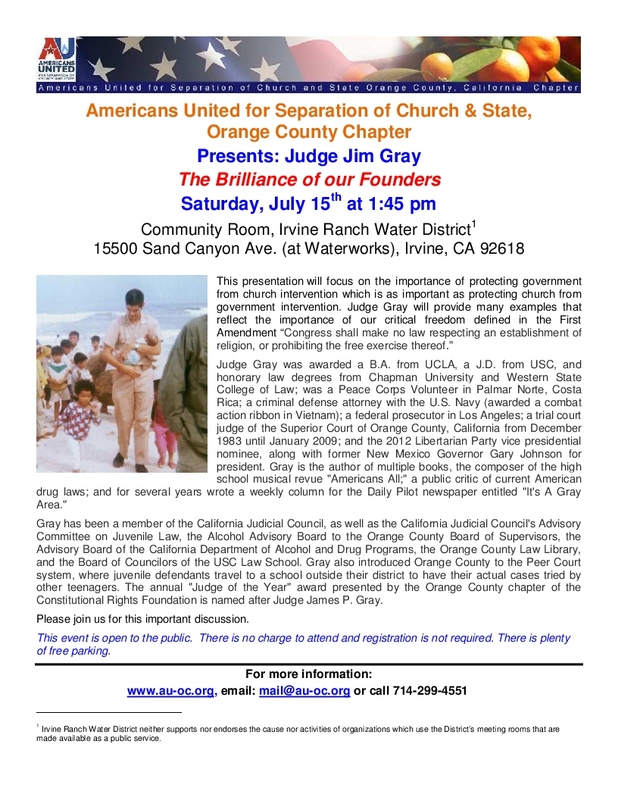 The annual "Judge of the Year" award presented by the Orange County chapter of the Constitutional Rights Foundation is named after Judge James P. Gray.